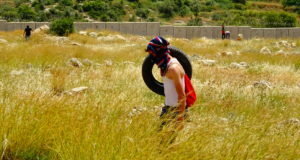 On Tuesday, 27th May, approximately 500 residents from the village of Ni’lin and Al Midya in the Ramallah governorate, as well as international and Israeli activists, converged in Al Midya to protest against the construction of Israel’s illegal apartheid wall (also commonly referred to as the annexation wall), which will steal yet more of the villages’ lands and effectively turn their villages into a prison. 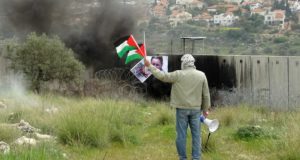 After the great success of stopping construction work the previous Friday, activists marched enthusiastically up the hill towards the bulldozers, which were surrounded by razor wire and two lines of Israeli soldiers. Once protesters were approximately 30 metres away, soldiers began firing rubber-coated steel bullets, and launched a barrage of tear gas, utilising a jeep-mounted tear gas launcher, capable of firing 30 canisters of tear gas at once. Demonstrators were quickly overwhelmed by the gas, some requiring hospitalisation. One journalist from Al Jazeera news, Jivara Bouderi, was carried out on a stretcher after asphyxiating due to tear gas inhalation. Approximately 30 activists were injured with rubber bullets and tear gas, five seriously. Mohammad Ayed Sarour is currently in hospital after being shot in the side of the head with a rubber-coated steel bullet, breaking the bones of his skull. Another man, Machmoud Marwan Hawaji was also hospitalised after being shot in the jaw with a rubber-coated steel bullet, while Galib Khalan Amira required hospitalisation as a result of a beating he received from Israeli soldiers. He is reported to have flesh wounds around his spine, but the full extent of his injuries remain unknown. Another journalist from Wattan TV was hospitalised after being shot in the leg at close range with a rubber-coated steel bullet – illegal under Israeli law which stipulates that rubber bullets can only be used from a distance of at least 40 metres. In addition, one child was injured in the abdomen; and one international in the buttocks. Ten activists were detained, with eight already released. Two remain in custody – including the owner of the land upon which the demonstration took place. Despite the overwhelming and disproportionate response of the Israeli army to a non-violent demonstration, activists rallied and attempted many times to reach the bulldozers and prevent the further theft of land and geographic and economic isolation that the completed wall will bring. Ni’lin and Al Midya are surrounded by the illegal Israeli settlements of Nili and Na’ale to the west; and Modi’in Illit, Hashmon’im, and Mattityahu to the south – meaning that by the time the apartheid wall is completed, villagers will be surrounded on three sides by the wall, leaving only the north open to them. Local activists explain, however, that part of Israel’s master plan for the area includes the construction of an apartheid (Israeli only) road from Nili to Tel Aviv, cutting Ni’lin in two with only a one-way tunnel planned to enable movement between the two parts of the village; effectively denying half of the residents access to the rest of their village and the services located there. Approximately 140 families are losing their land with the construction of this part of the apartheid wall – one of the last portions of the wall to be constructed. The land that will be lost is some of the most fertile in the area – a common theme of the route of the wall and part of the reason it is commonly referred to as the annexation wall, because of the huge amounts of Palestinian land that it works to annex to Israel. Many of the families that will lose their land rely heavily on it, such as an elderly man who has just his 100 dounums (approximately 25 acres) to provide for his wife and two older, unmarried daughters. 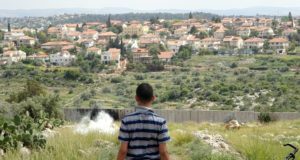 Residents are determined, however, not to give up their land without a fight, and have vowed to continue their attempts to stop the wall with regular demonstrations, calling people from throughout the West Bank to join them in their struggle.